ASSOCIATION FOOTBALL did not start with SKY Sports, Italia ‘90 or the Premier League. Moreover, it was not the sole property of the working class, although industrialised football did take root in the north of England rather than the south. The first rules of the game were formulated in 1848 in, of all places, Cambridge. It’s a fact that’s often overlooked, so what better way to remind people than to place a monument to commemorate where it all began? 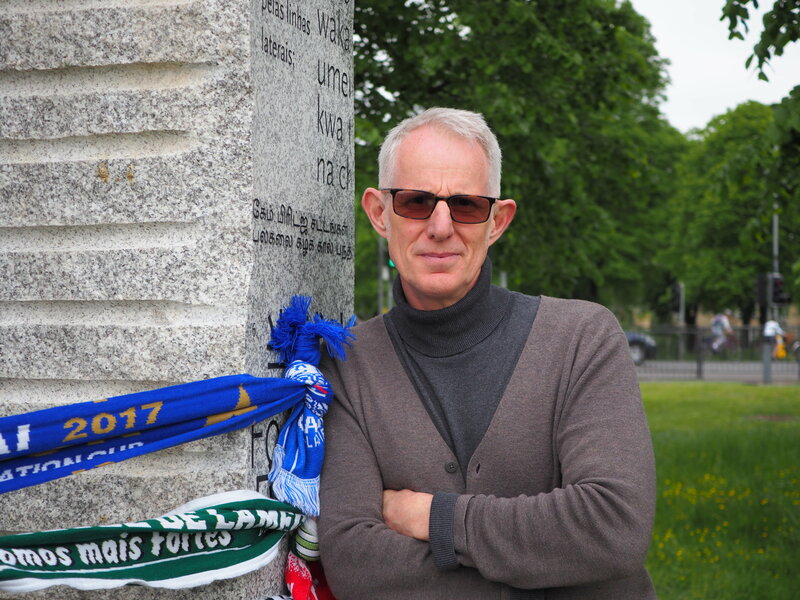 On Parker’s Piece, a well-trodden 25-acre plot of greenery in the heart of one of the world’s great seats of academia, two artists, Neville Gabie and Alan Ward, unveiled their eye-catching work to firmly mark the spot where organised football’s code was developed. 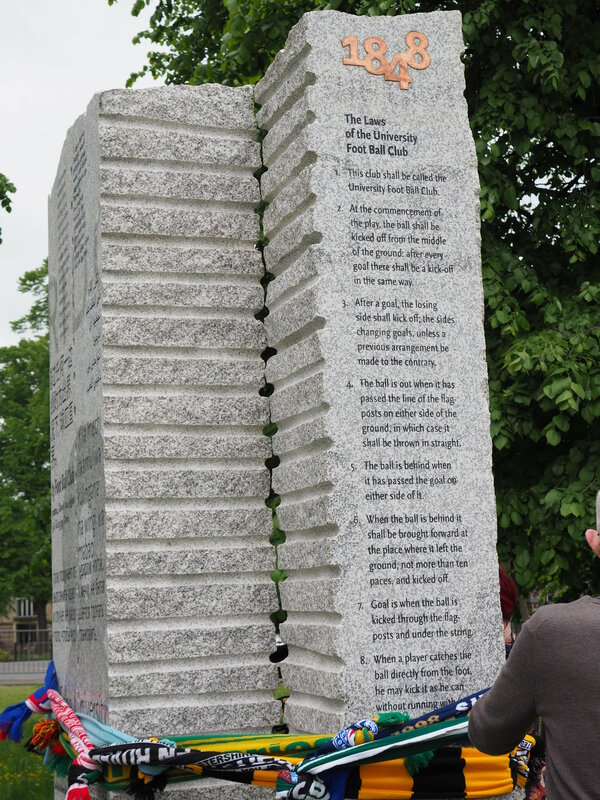 Neville, a South African who has a Forest Green Rovers season ticket, explained that the monument, comprising nine columns of granite, is a simple concept but one that is nevertheless striking. “We were eager to celebrate Cambridge as playing a key role in football’s history and we ideally wanted granite from the UK, but it just wasn’t available, so we found a quarry in Portugal – ironically belonging to a former semi-pro footballers – that could provide us with the required amount,” he said. Gabie and Ward both underlined the importance of making this project global. “It’s a sport played all over the world and Cambridge, itself, is a very cosmopolitan city,” said Alan, a Manchester-based designer who, for his sins, follows Norwich City. As they spoke, accents ranging from Hispanic to Asian could be heard from students as they walked across Parker’s Piece. The 1848 rules are inscribed in a number of languages on the monument, reflecting the global reach of the game. “They started out probably pinned to trees on this piece of land and they travelled, taken to all corners of the world by people like Scottish mill workers and British Armed Forces. It’s amazing that we are here at the very spot where it all started,” enthused Alan. The project has taken around three and a half years to come to fruition, but it is merely the start of the roll-out. 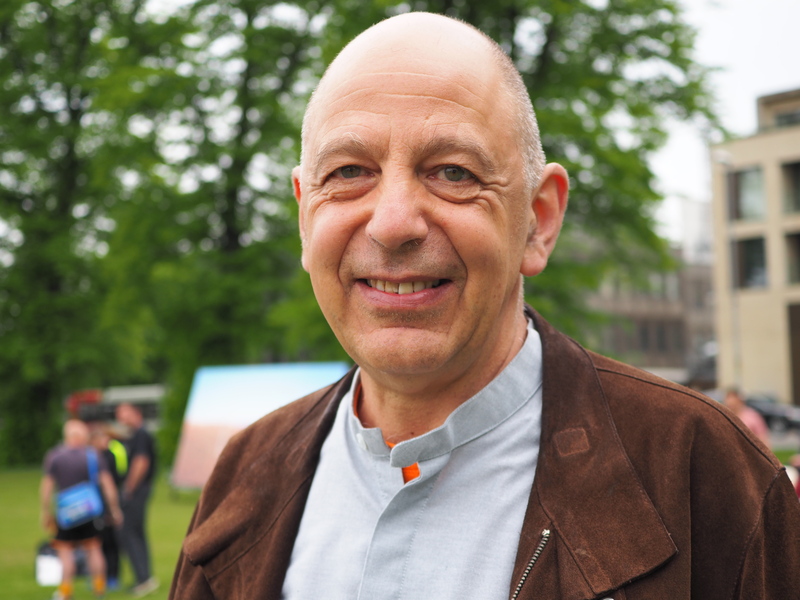 Four columns will be permanently based on Parker’s Piece, but five will spread the message worldwide, with one each being installed in Egypt, India, Brazil, Kenya and China. “We wanted this to be part of a global cultural exchange,” said Neville. The work of Neville and Alan provides a fitting reminder of the roots of the game, something that should be cherished. It was a privilege to see this unique project announced to the public and to meet the men responsible for it. All students of Association Football’s history should take their hat off to Messrs Gabie and Ward. The Cambridge Rules 1848 project was commissioned by Cambridge City Council and its global partners are Street Child United, Cambridge and Shanghai Greenland Shenhua Football Club. Hi Neil, a super read as always. I was very fortunate to meet Alan and Neville when I volunteered on the archaeological dig at the former BradfordPark Avenue ground. Two lovely chaps and good company. Next Entry Guest Slot: Should Russia be hosting?